THANK YOU for being a part of our community and joining us in our quest to grow in faith and knowledge of God and in love for our Lord Jesus Christ. Reasons for Hope* Jesus exists to glorify God by equipping you to know Jesus better, to love Him more, and to share your faith. It takes resources to accomplish our mission of equipping Christians with biblical knowledge, encouraging them in faithful living and empowering them with a bold testimony. 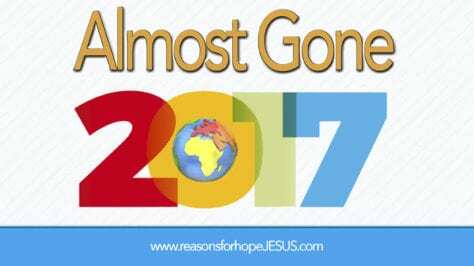 In 2017, Reasons for Hope* Jesus continued its ministry outreach in many ways. WEBSITE: We continued to improve our responsive, mobile-friendly, content-rich website. We wrote, posted, and distributed a weekly Got Questions? column of apologetics answers and reasoning on a variety of biblical and faith questions. We wrote, posted, and distributed a weekly Power of Hope column of encouragement and hope in a dark and secular world. We posted a daily devotional column, titled Our Daily Bread, written by Pastor Chuck Myer. CATEGORIES: We added to our categories, Timeless Truths, News & Views, Fun Facts, Who Said That, Bible Trivia, and Video Teachings. VIDEOS: We offered videos for instruction, encouragement, and increased hope on the website, on Facebook, and on the Reasons for Hope* Jesus and channels. PROVIDED CHRIST-CENTERED OUTREACH: With consistent, weekly, inspiring, and encouraging emails, articles, videos, and social media content — including special features for Easter, Memorial Day, Independence Day, Labor Day, Pro-Life Day, Veteran’s Day, Thanksgiving Day, the four weeks of Advent and Christmas Day — we have reached Christians worldwide with the hope that is found in Jesus Christ. Introduced Biblical Soul Care* 619 Hope, a new ministry being developed to teach the biblical principles of Christ-centered living for personal use and for use in comforting and caring for friends and family. We are a small ministry reaching the masses worldwide. And we need YOUR help. Please consider making a small donation to make a massive difference. Help us continue to reach the Kingdom of God with both the gospel of saving grace and the hope and joy of living in sanctifying power. Any amount is greatly needed and greatly appreciated. Reasons for Hope* Jesus is a 501c3 ministry. You don't need a PayPal account to donate. Click below to donate with a debit card, credit card, or PayPal. ~ CLICK BUTTON TO DONATE ~ Use a Credit Card or your PayPal account. Charitable contributions of stocks, bonds, or mutual funds is a tax-efficient way to support Reasons for Hope* Jesus. Example: You bought 100 shares of ABC, Inc for $10,000; It's now worth $12,000. You may be able to get a tax deduction of $12,000 and not report appreciation as income.